The first concert I ever attended was… forgettable. But the first “real” rock concert I went to was transformational. It was 1987, and I watched with amazement as White Heart blew my 11-year-old mind for the “Don’t Wait For The Movie Tour.” Last week, it was time for me to take my son to his first real rock concert. It was an amazing experience – both as a father and as a fan of well-crafted music. The night of music opened with someone who I’m sad to admit I had never heard of before this concert. It turns out Tyson Motsenbocker has been making some meaningful music for years, and even had his first full-length album released through Tooth & Nail Records. 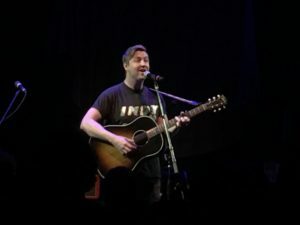 His short stories and endearing songs won the Chicago crowd over – and specifically made me a new fan… one that will surely be sharing his music in the near future. Colony House roared onto the stage with a blistering version of “You and I” followed by “Silhouettes” (their top 2 streamed songs on Spotify). You got the sense that this band will one day be headlining the tours and introducing their fanbase to young, up-and-comers. 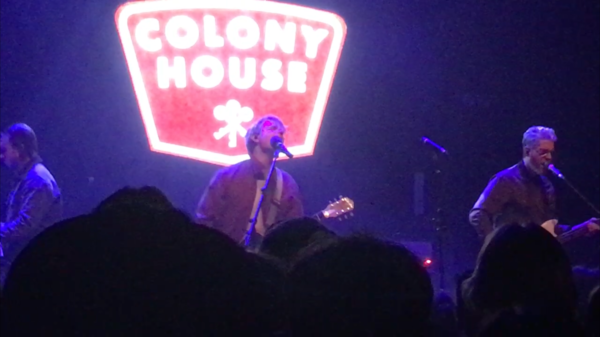 The crowd was completely into each song, and Colony House was given a full feature set, so they were able to belt out 10 songs off of their first two albums. I thought the highlight of their set was their 2014 power anthem “Moving Forward.” They closed with “You Know It,” which has been their set closer for the last couple of years. Switchfoot needs no introduction as a band. In many ways, to Christian kids from the 90s and 00s, this is our generation’s Beatles. Their songs speak so eloquently to the human condition, that you can find their music on a local CCM station and also a mainstream Top 40 or Modern Rock station. And unlike some bands I grew up with — Petra, DeGarmo & Key, and even White Heart — Switchfoot isn’t a nostalgia act. Their songs are so well-written and well-produced that they’ve already stood the test of time for their 20+ year career, and we will still be listening to Switchfoot songs 2o+ years from now. 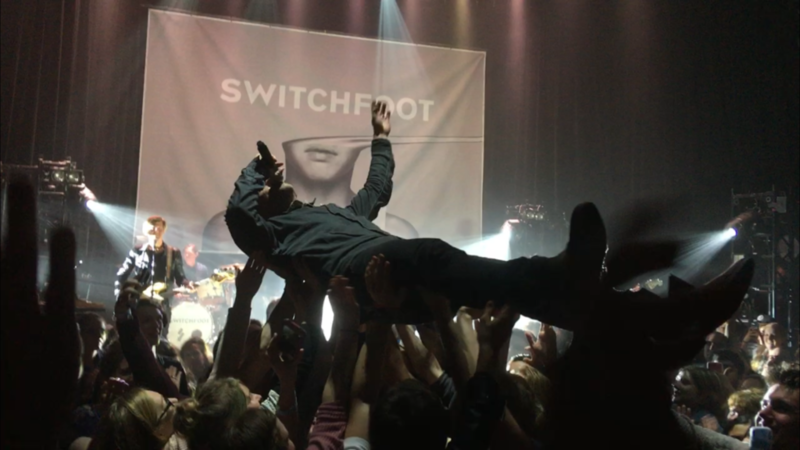 This concert did not disappoint Switchfoot fans from any era, as their jam packed 21-Song Set (!) featured songs from 8 of their 11 career studio albums. They started with their 2019 song “Take My Fire.” Their next 6 songs covered 5 previous albums. They seamlessly jumped from anthem to anthem and engaged the crowd at every step. 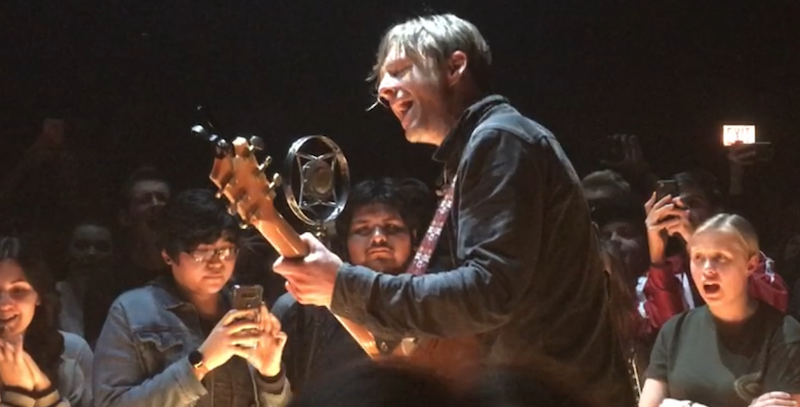 At one point, Jon Foreman announced, “We’re doing away with the set list tonight.” At this point, someone throws a request up to Jon on a big white sheet. He holds it up to the crowd, and it reads “MESS OF ME,” and a huge cheer erupts. It clearly wasn’t a planned moment, but this world-class band dives into the 2009 modern rock gem like pros… and it was my personal favorite moment of the whole night! Another highlight that brought on one of the loudest ovations of the night was Jon’s introduction of “cancer-free Jerome Fontamillas!” [Jerome was diagnosed with cancer in December, but underwent successful surgery to remove the tumor.] 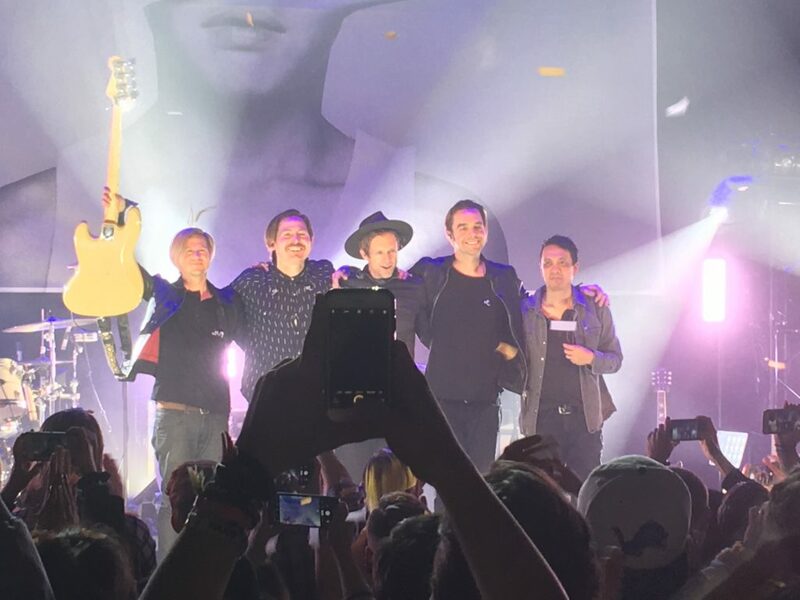 Switchfoot knows how to create special moments with their fans, and even shared “Our dream has always been to remove the line – not stage and audience – but we are all one. We are all in this together.” And Jon wasn’t afraid to hop off the stage and into the audience for several songs. The whole band did a short acoustic set right in the middle of the venue (and 3 feet away from my son and me). Don’t get me wrong, I enjoy the occasional rock show with high-end visual effects, synchronized video performances, and huge LED displays. However something is to be said about a band who just plain-old ROCKS. No special effects were needed to enhance this Switchfoot concert, and it refreshingly put the focus on the songs and the shared experience. Simply put, the Native Tongue Tour is amazing. This version of the tour is schedule to play nearly every night now through mid-April — check out their tour schedule for dates and cities. Definitely see it if you get the chance. And if not now, then maybe this Summer you can catch Switchfoot as an opening act for rock legends Bon Jovi [true story, but the tour is in Europe only].